In anticipation of Greek Easter this Sunday up in Manchester-by-the-Sea, we put our spin on a traditional Greek dessert. Growing up, we remember waking up on Easter morning to a sea of tasty pastries, ranging from Galaktoboureko (semolina custard in phyllo), to Kourabiedes (walnut sugar cookies), to Koulourakia (butter cookies), to Baklava. Baklava was always a favorite - sweet, sticky, layers of phyllo, chopped walnuts and honey. Our recent take on Baklava introduced a completely different flare, cheesecake. We poured a creamy cheese filling into crispy phyllo cups. The mild filling complemented the nutty crunch and mellowed out the sweet, sticky honey. Instead of walnuts, we added pistachios for a pop of savory and color. 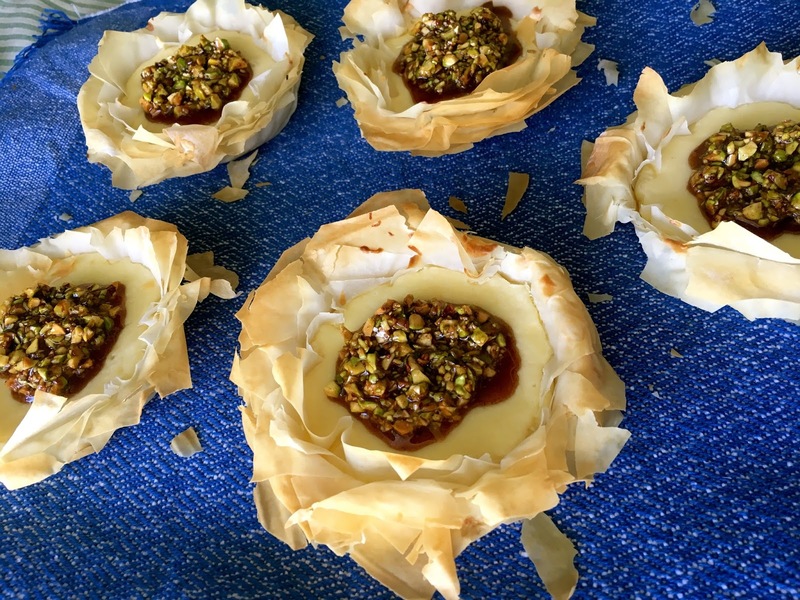 We look forward to replicating these tasty phyllo nests this weekend for our family. In a large mixing bowl, beat the cream cheese and sugar until smooth. Add the eggs, flour, vanilla extract, lemon zest, lemon juice and beat on medium speed until combined. Brush the bottoms of 12 small tartlets pans or cupcake tins with melted butter. Lay a square of phyllo dough into each tin. Brush a little butter over the dough and continue the layering of phyllo then brushed butter, 6 times in each tin. Fill each tin with a 1/4 cup of the cheesecake mixture. Bake for 20-22 minutes or until the phyllo is golden brown and flaky and the filling is set. Cool completely on the counter or on a wire rack and then in the refrigerator for at least 2 hours. While the tarts are cooling, add the sugar, water, honey, cinnamon and salt to a small saucepan. Turn heat to medium and bring to a boil. Reduce heat and simmer, uncovered, for 10 minutes, stirring occasionally. Stir in the pistachios and remove from the heat. Let cool. When ready to serve, spoon the Honey Pistachio Topping atop the tarts and enjoy. Makes 12 tartlets.